An extremely rare and unusual map prepared in 1893 for the Chicago World's Fair or, as it is better known, the 1893 Columbian Exposition. Although separated from the cane (not present) in the current example, this is the earliest known map printed specifically for includes with a cane - hence the term cane map. The genre was invented by the Columbian Novelty Company and, as the map itself notes, the patent was still pending when issued for the fair in 1893. All subsequent cane maps, most of which date to the first half of the 20th century, follow on model of this cane as patented by the Columbian Novelty Company. The map is printed and hand colored on both sides - although in the current example the verso or back side is laid down on translucent archival tissue - it remains readable. 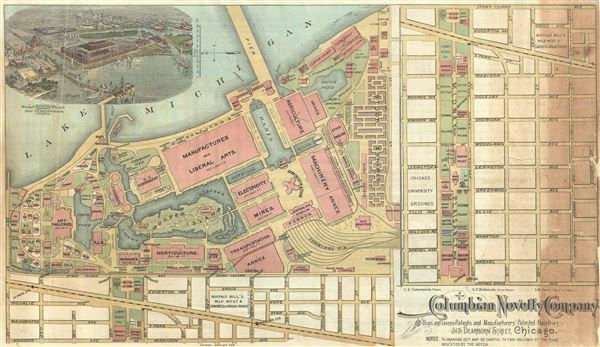 The primary side shows the grounds of the Columbian Exposition, now Jackson Park and the Field Museum, naming all important buildings walks, pavilions, markets, etc. Among the specific sites noted are 'Buffalo Bill's Wild West Show and Congress of Rough Riders,' the Chicago University Grounds, and the various pavilions established for manufacturing, mining, transportation, liberal arts, agriculture, machinery, etc. In the upper left quadrant there is an aerial view of the entire fair. A larger inset along the right hand side of the map focuses on the Midway from Stony Island to Cottage Grove. Average. No cane. This map came to us as is. Due to fragile state condition we backed it with archival tissue, partially obscuring the back side of the map which details the Loop. Repairs and typical discoloration, right side. Discounted accordingly.